I don’t like using the word “important” when describing entertainment. All entertainment is important, and there are a great many things more important than entertainment. But if you were to use the word important to describe This War of Mine, I wouldn’t argue with you. 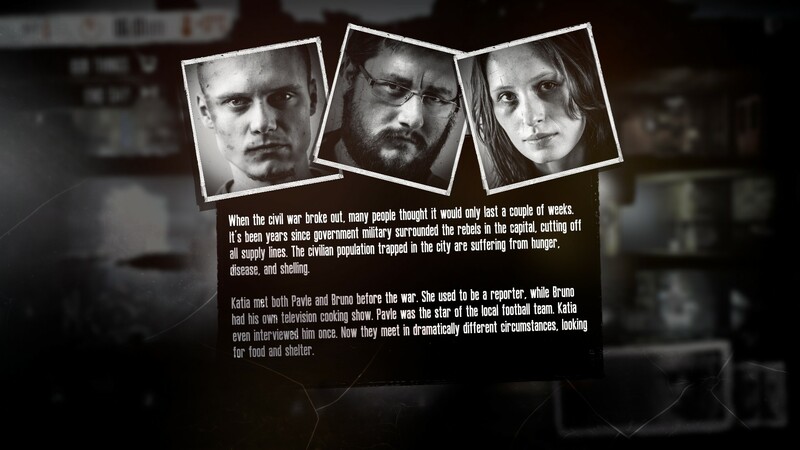 It is, as far as I’m aware, the first in a genre I’d call Civilian War Survival Simulator. While there is a tremendous amount to give this game its due praise for, the visuals might be least among them. This Warof Mine is an attractive game with an interesting presentation, but it doesn’t push any graphical boundaries, nor does it need to. 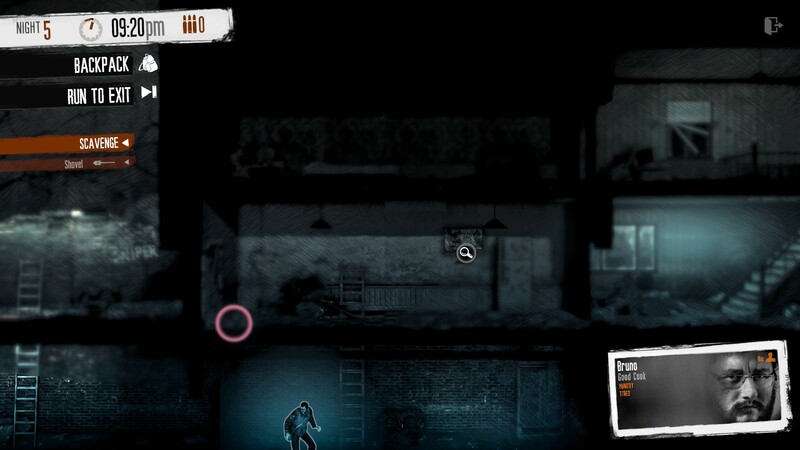 The game is played primarily on a 2D grid of separated rooms, often apartment buildings. Though it is done with polygons and the perspective changes with the moving camera, it could have just as easily been done in 2D with sprites. This is what 80% of the game looks like. 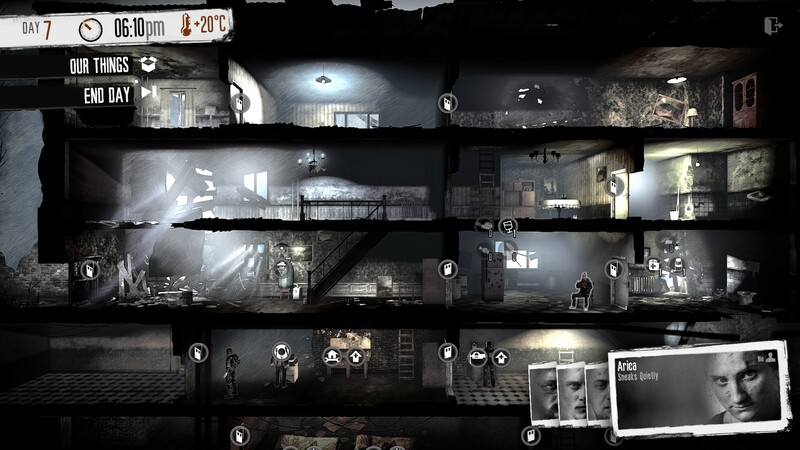 A great deal of the game focuses on the visibility of different rooms, and this is handled with some well executed use of graphical effects. The further you are from a room, the more obscured and sketchy it appears. Closer rooms that you’ve seen before are merely blurred, and things with a clear line of sight are sharp. There is a strong focus on stealth, particularly early in the game when you have no reasonable way to defend yourself, so both the sound made by your own actions and the sound made by others is visually indicated. If you decide to bust up an old dresser with a hatchet, for instance, a subtle shockwave will extend out from you, stretching out for several rooms. If you are running, the shockwave is smaller. And sound near enough to be heard but not within line of sight is indicated by a small red circle. The menus in the game are clear and easy to navigate, and there are loads of little details that define the world and the attitude of the people. (One particular instance of the word “sniper” still has me curious about whether I was taking my character’s life into my hands every time I scavenged in a given area.) So overall the graphics were functional and effective, but not nearly as notable as some of the other aspects of the game. At its core, the gameplay is very simple. During the daylight hours your group of survivors works on the day to day requirements of survival. You’ll cook food, craft items, and keep yourself healthy. During the nighttime hours you’ll pick a designated scavenger and pick a location to scrounge for materials. But as the game rolls on, each of these will become more difficult. OH JEEZ WHAT’S THAT NOISE RUN! Your first enemy is hunger, and it will prove to be one of your most consistent ones. Ideally your goal is to be self-sufficient, or reasonably so. To achieve this you’ll need to work your way through a series of tech trees in the form of “workshops” that you can place in your shelter. A workbench will allow you to first craft basic things like chairs, water filters, and beds. Once you have a metal working station you can start crafting tools like lock picks or shovels, and eventually firearms. A crude stove makes raw food more nutritious, and an improved stove does it more efficiently. In time, you might gather the resources to install an indoor garden and a few rat traps to keep yourself fed with meat and veggies, but for that you’ll need a steady flow of fertilizer. Or maybe you decide your best defense is a good offense, and start manufacturing firearms and armor. But then you’ll need a steady flow of gun powder for packing your own shells. Sometimes you can get these by crafting (or hording) high value items and trading them with the traveling merchant, but he doesn’t show up every day. So your primary source of material will be scavenging, which makes up the other half of the game’s mechanics. First, you’ll need to pick a scavenger, and each of your characters will have different strengths. An expert scavenger will find more stuff. A quiet character will make less noise, a fast character is… fast. Others have skills of less obvious utility, like mathematics or skill with children. While that person is scavenging, everyone else will be sleeping (in or out of a bed depending on how many you have) or guarding. Guarding is useful because (particularly before you patch the holes in the walls and fortify the door) raids are common and can not only cost you items, but can injure your survivors. Once you’re ready to scavenge, now you need to pick a place. The general risk/reward is spelled out for you, with potential trade, the resources available, and the likelihood of danger all listed in the description. When you pick a place you’ll have a few hours to find, buy, or steal goods. Certain doors need to be picked or pried. Others must be sawed open. A thorough search of an area will sometimes reveal a hidden stash, and even in places that are well guarded some care can get you in and out safely if you avoid confrontation through alternate routes or good old fashioned hiding. After you’ve survived a few weeks, the game starts heaping on the difficulty. By then you’ll be fresh out of “safe” places to scavenge and General Winter will have shown up. Now you need to heat your home or face constant illness (which is difficult to cure without the VERY rare medicine). You can’t just filter rainwater either. Now you need to melt snow, which must be gathered. Snow or combat might block off valuable scavenging grounds. Things just go from bad to worse. I knew it was time to start building my armory when I overheard soldiers in a construction site coordinating a pincher maneuver on me before I’d found so much as a roll of duct tape. If I had a criticism, I’d say that the saving system in the game is a bit harsh. You can have only one game going at a time, and it is roguelike enough that you can only have it saved once, with no restoring an earlier save to resurrect your precious dead survivor after you lingered too long and got shot. It was good enough. No spoken dialogue, suitable music. Look, don’t come to me looking for critiques of sound. These ears are just for show. There isn’t technically a story beyond the snippet of a backstory you get for each of your current characters and the knowledge that they are in the sealed capital of a country embroiled in a years long civil war. The real story is the one that forms through your struggles. 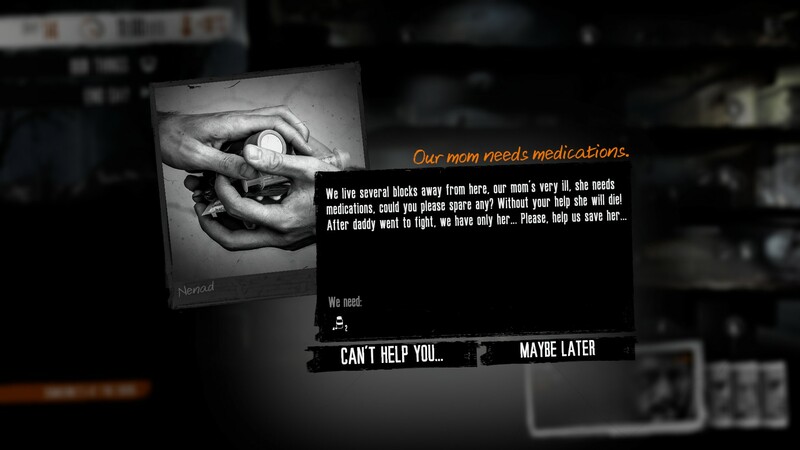 Seriously, if you’re anything like me the internal turmoil that will come from having to trade the medicine that might save your sick friend’s life in exchange for enough food to feed one of—but not all of—the other survivors has got as much or more impact than the best written story out there. Let’s watch their lives spiral into destruction, shall we? I… I have to give this game a good score, because it is playing ME as much as I’m playing IT, but… man. Games are supposed to be fun, you know? This one… It caused my soul to shrivel. It made me question what I would do, or could do, in a situation that can happen, and indeed is happening. Every decision I made felt wrong. Every triumph was just pushing out the inevitable for a few more days, or even hours. It was impactful. It was effective. It was the exact opposite of fun in all of the best possible ways. I hope that make sense. I need to go sit and stare at a wall for a while. 9.0 / 10: A deep game in terms of both content and relevance, providing engaging gameplay tempered with the lingering fear of the near-reality it represents.